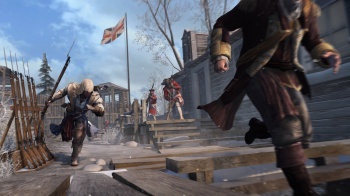 Assassins Creed III is "really is as close as you could get to a big budget new IP this late in the hardware cycle." At least, according to the game's creative director, Alex Hutchinson. The comment was made in an interview with Eurogamer, in which Hutchinson defended Ubisoft's decision to turn Assassin's Creed into a annual franchise. He argues that the guaranteed cash generated by yearly sequels allows the company to take bigger risks. "The core team on this one has been working at it for almost three years, which is something you can almost never get in the industry these days - it's too expensive, too risky," he said. "So we need the other projects to support that kind of development - these big jumps." "It's funny, people say it's about how often you release new entries, but I really think it's about how good they are," he added. It does indeed. Last year's Assassin's Creed: Revelations was the most poorly received title in the Assassin's Creed II trilogy. In fact, its Metacritic score of 80 makes it the lowest scoring title in the main series. Hutchinson went on to argue that since Assassin's Creed sequels feature different characters in different settings, they're a lot like new IPs. "Also, the beauty of Assassin's is that if you do it right it's kind of a new IP," he said. "It's still about navigation and combat, but it's a brand new hero, brand new setting, brand new fantasy. It really is as close as you could get to a big budget new IP late in the hardware cycle." Hutchinson wouldn't confirm whether or not Assassin's Creed III will receive direct sequels in the same way Assassin's Creed II did. "We also know players love new characters and radical changes so we're still figuring a few things out," he said. "I don't know. I think it would be kind of neat at some point to say 'Connor is a character, he lived in this big epic game, that's his story', instead of trying to drag it out too much." Now the idea of a publisher hedging its bets by using guaranteed money spinners to generate income to cushion riskier, innovative projects isn't new, movie studios have been doing it for years. The idea, however, is that the riskier projects are generally new IPs that, over time, become money spinners in their own right. Instead, Ubisoft is producing sequels on a yearly basis in order to generate enough money to create bigger sequels.